On April 24, 2012, Consumer World, a consumer education organization based in Massachusetts, published the results of its survey on Talking ATM and talking fare machines in the Boston area. (Read full press release below.) The results show that far too many ATMs and fare machines are still not accessible to people with visual impairments. One bank that is doing a good job? Bank of America, where every ATM tested was a working Talking ATM. ConsumerWorld.org is a consumer education website that was launched in 1995. Its founder and editor is long-time consumer advocate, Edgar Dworsky, who is a former Assistant Attorney General in consumer protection in Massachusetts. Consumer World’s press release is reprinted in full here. Read the full release on the Consumer World website. Boston (April 24, 2012)– Many ATMs and MBTA fare vending machines in the Boston area are not accessible to visually-impaired customers according to results of a test by Consumer World. U.S. Department of Justice rules promulgated in 2010 under the Americans with Disabilities Act require at least one automated teller and one fare machine at each location to be speech-enabled by no later than March 15, 2012, so they can provide step-by-step instructions when earphones are plugged in. Consumer World tested over 200 ATMs and fare machines at dozens of banks and T stations, and found many at two prominent entities that did not provide proper audio: Citizens Bank and the MBTA. At Citizens, the second largest bank in Massachusetts, nearly half (47%) of the ATMs checked were either not producing audible speech or had yet to be outfitted with speech-enabling technology. At the MBTA, 60% of fare vending machines checked either produced no voice when earphones were attached or breached the customer’s privacy by simultaneously announcing details of purchases and card balances over built-in loudspeakers for anyone nearby to hear. All MBTA fare machines had the required sound output connections present, but many simply did not work right. According to Department of Justice spokesperson Xochitl Hinojosa, however, ATMs and fare machines that are made accessible but no longer work properly are not technically in violation as long as at least one machine at each location still functions correctly. One bank going the extra mile for customers is the often criticized Bank of America, which is the largest bank in Massachusetts. All three dozen of their ATMs checked at 16 different locations were sound-enabled and operating. A spokesperson for the bank said that all its ATMs in the state are speech-enabled although they are not required to be. Contrast that with Citizens Bank where three dozen machines were also tested. At the 25 different locations visited, 17 ATMs did not produce speech. Most of the failing machines were silent when earphones were plugged in despite bearing a “Talking ATM” sign, while a half dozen other machines had not yet been converted for sound. For this test, Consumer World checked a total of 212 ATM and fare machines — 136 ATMs at 84 locations of 22 different banks and convenience stores, and 76 MBTA fare machines at 15 different locations — between April 8 and 16. At the MBTA, a total of 76 fare machines were tested at 15 different locations. Despite all machines being labeled “press 5 for audio,” more than one-third did not utter a sound through the provided audio jacks. In addition, over a dozen machines announced details of the transaction through loudspeakers despite having a headset plugged in, seemingly contrary to federal rules that require machines to provide privacy for their users. Fortunately, though, most visually-impaired individuals can avoid using fare machines altogether by getting a special fare-free Charlie Card. Visitors and others who do not qualify for free passes, however, could well be disadvantaged by the malfunctioning machines. 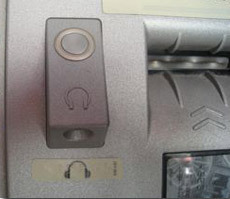 Among other requirements, ATMs and fare machines must be equipped with either a telephone receiver or an audio output jack into which headphones can be connected to allow the customer to hear instructions, follow the progress of their transaction in private, and get an audio receipt of their transaction. Violation of the federal rules carries a civil penalty of up to $55,000 for the first violation, and up to $110,000 for subsequent ones. Visit the Consumer World website for complete charts with test results. Copyright © 1995-2012 Consumer World®. All rights reserved. Duplication of the collection of links herein, or any portion thereof, is strictly prohibited. Reprinted on LFLegal.com with Permission.